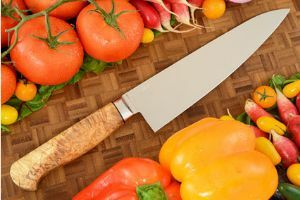 Cutting edge length: 8.20 in. The heat treatment followed the formulas developed by Bill Burke in conjunction with Mastersmith Ed Fowler and creates some of the sharpest and most long lasting edges found anywhere. The blade is hand forged from 52100 carbon steel with a low temp triple quench and triple temper. 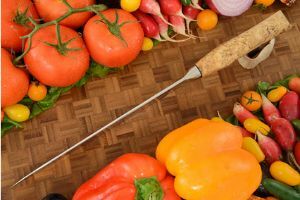 Many knife users as well as knifemakers feel that this combination results in the best performance currently found in the knife industry. The blade is differentially heat treated for an extremely hard, long lasting edge with a softer, supportive spine. 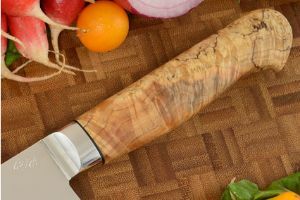 The handle is formed from presentation grade spalted box elder burl (Acer negundo). 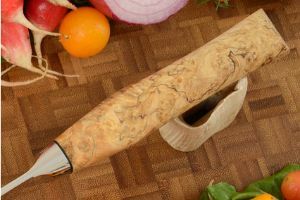 The convoluted figure combines light and medium tones with darker spalting lines. A black fiber spacer assists the handle to adjust to temperature and humidity changes. 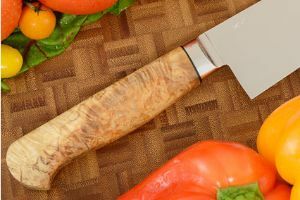 By using stabilized wood, Mastersmith Burke ensures that the handle will hold up to the demands of either a home or commercial kitchen. 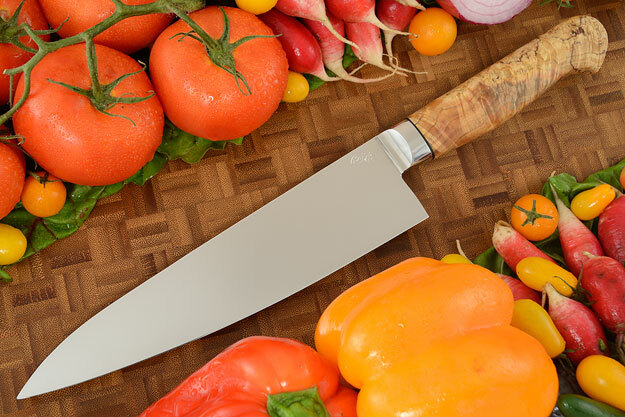 A 416 stainless steel bolster forms a perfect seal to both blade and handle. 0.125 0.0390625 125 39.0625 Trailer Started.